Reste qu'une ironie savoureuse émane de la protagoniste, la mise en scène de Mark Waters tient en haleine et l'interprétation est correcte dans l'ensemble. A year from now, Vampire Academy, however, will be completely forgotten. For the sake of everyone involved who is capable of so much more, that's a good thing. The only thing the movie really has going for it is star Zoey Deutch. 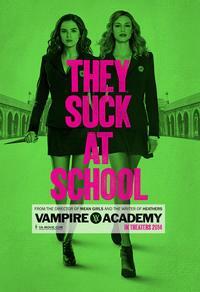 The only thing scary about Vampire Academy is how bloody boring it is. The misbegotten mashup will please few genre fans.